Orville was an accomplished guitarist by the age of 20 and performed on the Kalamazoo stage for over twenty years. He was also a song and dance man, a baritone vocalist, and a stage prop builder. In addition, he managed a number of holiday entertainment features and a small community theater group. Orville and his band of fellow stage brothers were a local favorite. They were often called back for an encore and were known to schedule a second performance to accommodate those who had been turned away due to a full house. 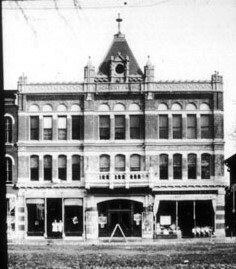 In the early days, the main theater in Kalamazoo was the small and antiquated Union Hall on Portage Street. But on May 8, 1882, the Academy of Music opened its doors with all the amenities of a modern theater. Photo courtesy of the Clarence L. Miller Family History Room, Kalamazoo Public Library, Kalamazoo, Michigan. Designed by Dankmar Adler of Chicago, The Academy of Music had a number of innovations in theater construction including the new concept of gradually raising the height of the floor from the edge of the stage towards the back, thus the back seats sat higher in relation to the front seating. In addition, it had colored gas lighting controlled by a new gadget called a dimmer switch, a rain machine, a thunder cart, and six painted backdrops. The walls and proscenium were polished cherry and a nine foot wide, 100 light chandelier hung over the audience. In the photo above, the entrance to the theater is in the middle with retail shops on each side.